I missed out on doing the April tag last month as there was so much going on so I was determined to do the May one. I don't have half of the stamps that he has, but I tried to improvise as best as I could and hopefully, I'll be able to start collecting all of his amazing stamps at some point. Here is the tag that Tim did for May. And the one below is mine. It's a little different from Tim's but uses a few of the techniques he showcases on his tag. I used a green tissue paper for the base. I then stamped on a variety of stamps in different colours. I added a trim and measuring tape washi tape. My dress form is actually a magnet backed die cut which I did a while ago. I pulled it apart to use in this project. I coiled a length of brown rosette trim in a circle around a Gluber before sewing on a flower centre and pearl. Instead of using Utee for the green mini flowers, I just used Glossy Accents and let them dry over night. I stained some kitchen twine and wound it around the flower stems before sticking them with a couple of sewing pins and hot-glueing them to the tag. Funny thing; the clothes hanger is from one of Miss C's girl's paper doll books. I used alcohol inks to colour it bronze as it was plain wire. The butterfly pendant and scissors trinket was from my stash. The green trim at the top was coloured green with Distress Stain. 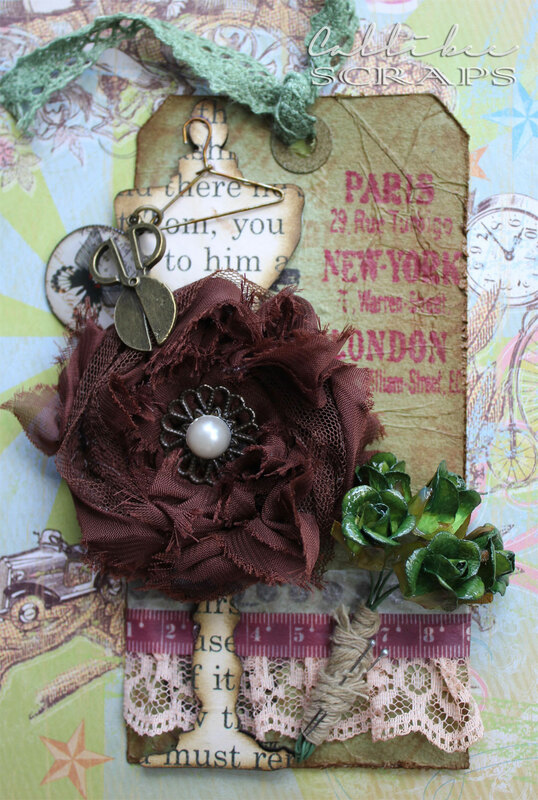 Grunge Paper for the tag, Tag Die, Stampers Anonymous Papillon CMS106 stamps, Dress form die from the Sewing Room die, Distress Stains and Distress Inks, all from Tim Holtz collection. Washi tape, peach trim, tag trim, green flowers, pendant and scissors all sourced locally. This is lovely - I love that handmade flower and havent seen the tape measure washi tape before (think I need some!). very nice tag :) I love that scissors! This is beautiful and creative, i love all! Love how creative you were with this tag! The large flower out of rosette trim is brilliant!! !